This article focuses on how teachers worked to build a meaningful curriculum around changes to a neighborhood and school grounds in a precinct listed for urban renewal. Drawing on a long-term relationship with the principal and one teacher, the researchers planned and designed a collaborative project to involve children as active participants in the redevelopment process, negotiating and redesigning an area between the preschool and the school. 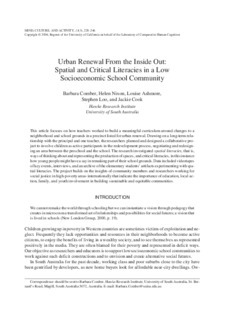 The research investigated spatial literacies, that is, ways of thinking about and representing the production of spaces, and critical literacies, in this instance how young people might have a say in remaking part of their school grounds. Data included videotapes of key events, interviews, and an archive of the elementary students' artifacts experimenting with spatial literacies. The project builds on the insights of community members and researchers working for social justice in high-poverty areas internationally that indicate the importance of education, local action, family, and youth involvement in building sustainable and equitable communities.